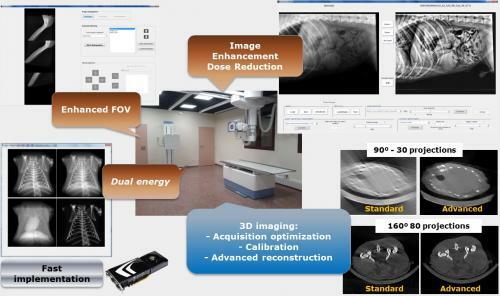 The main objective of this line of research is the design and development of a new generation of Radiology systems, for clinical and veterinary applications, through the research and development of innovative technologies in advanced image processing oriented to increase image quality, to reduce dose and to incorporate tomography capabilities in Digital Radiology Systems. The latter would allow bringing tomography to situations in which a CT system is not allowable, for instance when the patient cannot be moved (during surgery or ICU) or due to costs issues (underdeveloped countries or rural areas). On the other hand, the reduction of radiation dose received by the patient will reduce risks involved in this imaging modality reducing the social reservations towards its use. The visualization and quantification of the function of certain organs in laboratory animals by means of nuclear medicine techniques is demonstrating to be a tool of great relevance for the characterization of the phenotype of transgenic animals in the study of models of human diseases, as well as for the discovery and development of the new drugs and biochemical probes. One of the difficulties that PET imaging must face working at the right scale for small animals is its relatively low spatial resolution, hindering the localization of the activated structures. This poses the urge of using other imaging modalities that provide anatomical information to localize functional data. X-ray CT is the anatomical modality preferred for small animal due to their high resolution and the possibility of being integrated with nuclear imaging systems. The combination of these systems enables synergies between both modalities, making it possible the use of the data acquired from one modality (CT) to process the data from the other (PET), for example to perform corrections or to help in the reconstruction with a priori information. In our laboratory we develop new technologies for high-resolution CT systems, some of which have been transferred to the industry. M. Abella, C. de Molina, N. Ballesteros, A. Garcia-Santos, A. Martínez, I. García, M. Desco. Enabling tomography with low-cost C-arm systems, Plos One, 2018 (in press). M. Abella, E. Serrano, J. Garcia-Blas, I. García, C. de Molina, J. Carretero, M. Desco. FUX-Sim: An implementation of a fast universal simulation/reconstruction framework for X-ray systems, Plos One 2017, 12(7): e0180363. F.P.J. Abascal*, M. Abella*+, E. Marinetto, J. Pascau, M. Desco, A novel prior- and motion-based compressed sensing method for small-animal respiratory gated CT, PLoS One 11(3), e0149841, 2016. M. Abella, C. de Molina, N. Ballesteros, A. Garcia, I. Garcia, A. Martínez, M. Desco. Setting up a low-cost C-arm for its use as a tomograph: preliminary results, Proceedings of the 5th International Conference on Image Formation in X-Ray Computed Tomography (CT meeting 2018), 143-146, 2018. C. Martínez, J. A, Fessler, M. Desco, M. Abella. Statistical Image Reconstruction with Sample-Based Beam-Hardening compensation for X-ray CT, Proceedings of the 5th International Conference on Image Formation in X-Ray Computed Tomography (CT meeting 2018), 11-14, 2018. N. Ballesteros Tenrero, M. Desco, M. Abella. Respiratory gating method for low-dose small-animal CT studies: preliminary results, Proceedings of the 5th International Conference on Image Formation in X-Ray Computed Tomography (CT meeting 2018), 173-176, 2018. J. F. P. J. Abascal, M. Abella, C. Mory, N. Ducros, C. de Molina, E. Marinetto, F. Peyrin, M. Desco. Sparse reconstruction methods in x-ray CT, Proceedings of SPIE Conference on Developments in X-Ray Tomography XI. Optical Engineering & Applications, 10391, 2017 (doi: 10.1117/12.2272711). E. Serrano, J. Garcia Blas, J. Carretero, M. Abella, M. Desco. Medical Imaging Processing on a Big Data platform using Python: Experiences with Heterogeneous and Homogeneous Architectures, Proceedings of the 17th IEEE/ACM International Symposium on Cluster, Cloud and Grid Computing, 830-837, 2017. A. Martínez, A. García, R. Polo, M. Desco, M. Abella. XAPLAB: software de diseño de protocolos de adquisición con equipos de rayos X, Libro de actas del XXXV Congreso Anual de la Sociedad Española de Ingeniería Biomédica (CASEIB 2017), 37-40, 2017. N. Ballesteros, C. de Molina, M. Desco, M. Abella. Corrección de artefacto por movimiento respiratorio para TAC de pequeño animal en estudios con bajas dosis de radiación, Libro de actas del XXXV Congreso Anual de la Sociedad Española de Ingeniería Biomédica (CASEIB 2017), 247-250, 2017. I. García, M. Desco, M. Abella. Método para visualización simultánea en imagen de rayos X de tejidos de muy diferente densidad. Libro de actas del XXXV Congreso Anual de la Sociedad Española de Ingeniería Biomédica (CASEIB 2017), 349-352, 2017. X. Ye, C. de Molina, N. Ballesteros, A. Martínez, M. Desco, M. Abella. Extracción de superficie con escáner de luz estructurada para tomografía de ángulo limitado, Libro de actas del XXXV Congreso Anual de la Sociedad Española de Ingeniería Biomédica (CASEIB 2017), 243-246, 2017. C. Martínez, N. Ballesteros, C. de Molina, M. Desco, M. Abella. Corrección del efecto de endurecimiento basado en una linealización 2D, Libro de actas del XXXV Congreso Anual de la Sociedad Española de Ingeniería Biomédica (CASEIB 2017), 529-532, 2017. E. Serrano, J. Garcia Blas, J. Carretero y M. Abella. Hacia la convergencia entre HPC y Big Data: experiencia acelerando una aplicación de procesamiento de imagen médica, XXVIII Jornadas de Paralelismo, 563-568, 2017 (ISBN-13: 978-84-697-4835-0). E. Serrano, J. García Blas, I. García, C. Molina, J. Carretero, M. Desco, M. Abella. Design and Evaluation of a Parallel and Multi-Platform Cone-Beam X-Ray Simulation Framework. CT-Meeting 2016 Proceedings: The 4th International Conference on Image Formation in X-Ray Computed Tomography (CT meeting 2016): 423-426, 2016. C. Martínez, C. de Molina, M. Desco, M. Abella. Simple method for beam-hardening correction based on a 2D linearization function. CT-Meeting 2016 Proceedings: The 4th International Conference on Image Formation in X-Ray Computed Tomography (CT meeting 2016): 475-478, 2016. A. Martínez, A. García-Santos, I. García, E. Serrano, J. García, C. de Molina, R. Polo, M. Desco, M. Abella. A software tool for the design and simulation of X-ray acquisition protocols. CT-Meeting 2016 Proceedings: The 4th International Conference on Image Formation in X-Ray Computed Tomography (CT meeting 2016): 323-326, 2016. C. de Molina, J.F.P.J. Abascal, M. Desco, M. Abella. Study of the possibilities of Surface-Constrained Compressed Sensing (SCCS) Method for Limited-View Tomography in CBCT systems. CT-Meeting 2016 Proceedings: The 4th International Conference on Image Formation in X-Ray Computed Tomography (CT meeting 2016): 491-494, 2016. E. Serrano, J. Garcia-Blas, J. Carretero, and M. Abella, Architecture for the Execution of Tasks in Apache Spark in Heterogeneous Environments, in 4th International Workshop on Parallelism in Bioinformatics (PBio 2016). Euro-Par, 2016. C. Martínez, C. de Molina, M. Desco, M. Abella. Corrección empírica del artefacto de endurecimiento de haz exento de calibración. Libro de actas del XXXIV Congreso Anual de la Sociedad Española de Ingeniería Biomédica (CASEIB 2016): 2-4, 2016. E. Serrano, J. Garcia-Blas, J. Carretero, and M. Abella, Propuesta Arquitectónica para la ejecución de tareas en Apache Spark para entornos heterogéneos, in V Congreso Español de Informática (CEDI 2016), Jornadas Sarteco 2016. J. Garcia Blas, M. Abella, F. Isaila, J. Carretero, M. Desco. Surfing the optimization space of a multiple-GPU parallel implementation of an X-ray tomography reconstruction algorithm, Journal of Systems and Software, 95, 166–175, 2014. A Sisniega, J Abascal, M Abella, J Chamorro, M Desco, JJ Vaquero. Iterative Dual-Energy Material Decomposition for Slow kVp Switching: A Compressed Sensing Approach. IFMBE Proceedings, 41: 491-494, 2013. M Abella, JJ Vaquero, A Sisniega, J Pascau, A Udías, V García, I Vidal, M Desco. Software architecture for multi-bed FDK-based reconstruction in X-ray CT scanners. Comput Meth Prog Bio, 107(2): 218-232, 2012. J Pascau, JJ Vaquero, J Chamorro-Servent, A Rodríguez-Ruano, M Desco. 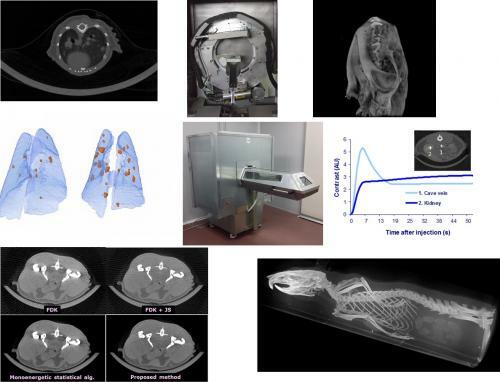 A method for small-animal PET/CT alignment calibration. Phys Med Biol, 57(12): N199-N207, 2012. M Paraíso, et al. Evaluation of the effect of calibration accuracy in a C-arm for its use in tomography. CASEIB 2012. M Abella, JA Fessler. A new statistical image reconstruction algorithm for polyenergetic X-ray CT. Proceedings of the 2009 IEEE ISBI, 165-168, 2009.